Bi-fold doors are doors that slide open, made from a series of panels that fold up against the wall like a concertina. They are also known as folding doors or room dividers because they can fold in or out and seem to give extra space and allow extra light inside the room. Single leaf doors are common in most modern homes; they can be incredibly inconvenient when you're trying to make the most of the space in your home. However, the bi-fold door makes a more attractive, sturdy and unique alternative, which pulls open from the center, giving a full view and full access to what's behind the door in one swift motion. Bi-fold doors can be internal and external. Internal bi-fold doors are generally used to cover smaller spaces like pantries, laundry rooms or wardrobes, while external bi-fold doors are mostly used to connect the inside of the home to the outside. External bi-fold doors are suitable and aesthetically pleasing when installing at the back of a house, leading into a garden or summer house etc. 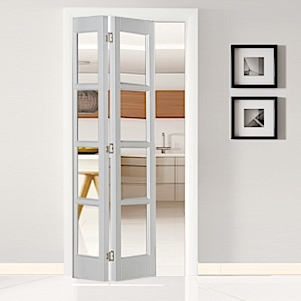 but internal bi-fold doors are found in all manner of places and are suitable for any number of applications. Flexibility: Ideal for connecting living rooms, kitchens, dining rooms and more, bi-fold doors, first of all, make your home stand out. Additionally, both internal and external bi-fold doors, made of all kinds of material (aluminum, wood or timber for example) are significantly flexible and allow customization at any time to suit personal requirements. Easy to Install: Bi-fold doors are deceptively easy to clean and fix. Once you have selected your door size, any DIY expert can easily install a bi-fold door. Internal bi-fold doors are even easier to set up than an external bi-fold door since they are relatively simple in terms of their hardware. Although one with enough ability can fix the doors, it is advisable to seek professional help in order to ensure proper fix. Security and Spectacular View: With little mess, external bi-fold doors provide full- length view of the outside and also maximize the amount of light input into the house. Besides aesthetics, external doors are highly functional with regard to security. The benefits that bi-fold doors feature a multiple point locking system on the sliding track instead of just one, as is observed in normal doors. Space Optimization: Bi-fold doors take up very less space when open, which is why they are the perfect option for interior spaces like laundry rooms or kitchen spaces. Unlike French doors or conventional sliding doors, bi-fold doors have the ability to fold themselves, leaving more space around. Energy Efficient: Bi-fold doors are glazed with large panels of glass, the type of which you choose can have a serious impact on your thermal efficiency. Good quality doors and well- designed installation helps keep the cold weather out and provide a high- performance insulation at home by eliminating draughts between the bi-folding door and the uPVC frame. Interior and exterior bi-folding doors both use a simple tracking system that runs along the panels, which are connected on a train. The doors work by folding in on themselves and then gliding along the tracking system with the help of a series of wheels or a lower tracking system, both of which lead to smooth motion and quiet operation. Bi-fold doors (particularly interior ones) generally come in pairs, with two doors folding to one side or with four that part in the center, with two doors folding back to either side. Ready to install bi-fold doors usually come with the complete package with all the tracking and fittings, that can be opened either inwards or outwards. It is this kind of flexibility and advantage that has led to their popularity in recent years amongst open-minded homeowners. Most bi-fold doors will have anywhere between two and seven panels, all of which will be connected with hinges and attached to the roller track at the top or bottom of the door (or both). They are remarkably easy to operate, though it's advised that exertion of too much force could end up pulling the doors out of the tracking system. To summarize, bi-fold doors are modern, functional and secure. They are durable and last for at least 10 years, regardless the material used (although, better the material, better the durability). There is no lack of choices in designs and nothing to spare when it comes to security. One can choose the best of the bi-fold doors under one’s budget as they are very cost- friendly too. Bi-fold doors also add value to the property. They give a dashing look to your house, making it look desirable and stylish. Hence, in terms of fashion, comfort, finance, and adaptability, bi-fold doors are harmless to experiment and a great way to bring about a change in regular home architecture.